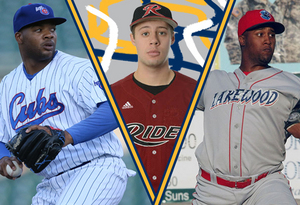 (York, Pa., April 6, 2016) - The York Revolution have added three pitchers to the 2016 preseason roster including York County native Eric Thomas. The team has also re-signed late-inning reliever Ty’Relle Harris, while adding fellow reliever Daniel Carela. The additions were announced on Wednesday by manager Mark Mason. A first-year pro, Thomas is set to make his professional debut when the club opens spring training next week. The 6’4 lefty completed a standout four-year career at Division I Rider (NJ) University last season, and begins his pro career in his hometown. The 23-year-old comes to camp with high praise from some of the organization’s all-time greats. Thomas capped his college career as the Broncs’ closer last season, going 1-0 with 10 saves and a 1.33 ERA, while holding opponents to just 19 hits in 27.0 innings. He struck out 36 batters in his 28 appearances, gaining attention as a professional prospect. Thomas was named the YAIAA Division I Player of the Year as a senior at Dallastown Area High School in 2011, posting a 1.24 ERA while batting .396 and helping lead the Wildcats to a division title. He was also a member of the varsity basketball team. Harris returns to the Revolution after serving as a key cog in the bullpen during the second half of 2015. After beginning the season with Grand Prairie of the American Association, Harris signed with York at the All-Star Break, and went 1-0 with one save and a 2.59 ERA in 16 relief outings and one start. The 6’4 righty held opponents to a paltry 13 hits in 24.1 innings, and struck out 28 batters while issuing just eight walks, posting a WHIP of 0.863. The Knoxville, TN native was originally drafted in the 19th round by the Atlanta Braves in 2009 out of the University of Tennessee, and also pitched in the Chicago Cubs organization, reaching Triple-A Iowa in 2011 and 2012. The 29-year-old had previously pitched in the Atlantic League with Bridgeport in 2013 and 2014, and owns a 3.57 career ERA in seven pro seasons. Entering his first Atlantic League season, Carela also projects to be a strong bullpen option for Mason. The seven-year pro is 15-9 with 15 saves and a 3.63 ERA in 183 career appearances, having allowed just 6.3 hits per nine innings and recorded 10.4 strikeouts per nine. The New York city native originally signed with the New York Mets in 2009 and was outstanding in his second pro season spent mostly with Brooklyn, rolling out a 1.63 ERA. The 6’3 right-hander spent parts of the next three seasons in the Los Angeles Dodgers farm system, before signing with the Philadelphia Phillies organization where he spent the majority of the 2013 campaign. Carela then opened the 2014 season with Windy City of the Frontier League, posting a 2.28 ERA in 26 games and recording seven saves, earning a late-season contract with the Atlanta Braves. Last season, the 28-year-old began the year with Wichita of the American Association before spending a dominant second half of the season with Rockland of the Can-Am Association, going 5-0 with a 1.46 ERA in 26 outings and allowing just nine hits in 24.2 innings while striking out 30. The Revolution now have 26 players under contract for the upcoming season. The club will unveil additional signings this Friday at 6 p.m. on the preseason’s final episode of “Revs Hot Stove Weekly” on SportsRadio 1350, woyk1350.com, and the WOYK mobile apps. The Revs will open the 2016 season on the road against the expansion New Britain Bees on Thursday, April 21. The club then kicks off its 10th anniversary season at home on Thursday, April 28 against the Sugar Land Skeeters. Full-season, partial season, mini plans, and individual tickets are on sale now at YorkRevolution.com. The York Revolution Professional Baseball Club is a member of the Atlantic League of Professional Baseball, and Atlantic League Champions in 2010 and 2011. 2016 will be the Revolution’s 10th anniversary season at 5 Brooks Robinson Way. PeoplesBank Park hosts all 70 home games in addition to myriad events through the entire calendar year. For tickets or more information, please call 717-801-HITS (4487) or visit the Revolution online at YorkRevolution.com.